So it turns out that cycling is faster than hitchhiking. 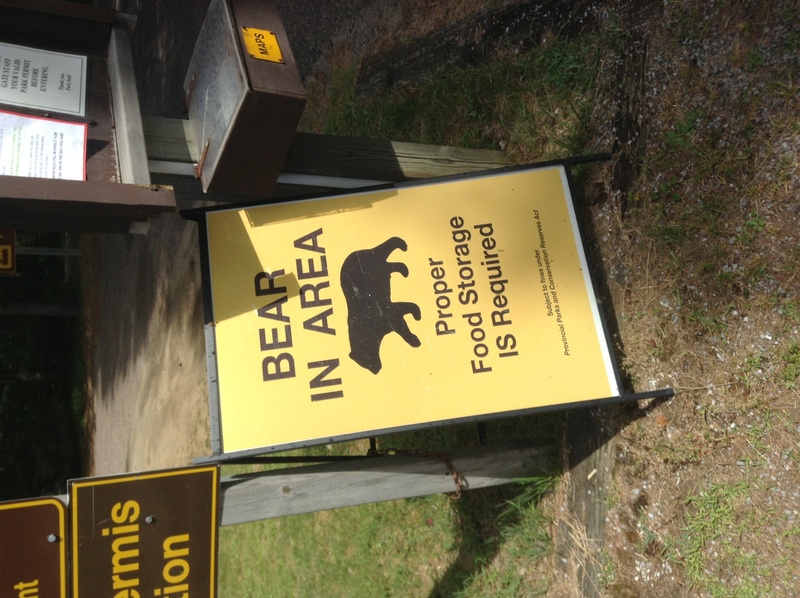 I first saw Ross standing by the side of the highway only a few kilometres from Mew Lake campground. It was not yet 9am and the road was very quiet. He was wearing jeans, a tshirt, a red bandana and a cheery smile. On his back he had a large yellow Ortlieb rucksack. His bike (a Surly Long Haul Trucker) was lying on the gravel by his feet. At first I thought he might have a flat tyre so I slowed down to see if he needed help. Ottawa!! Yes, I am finally closing in on the known world. I saw the first sign for the capital city on my way out of Huntsville. My skin pricked at the sight of such a familiar name. Unable to give Ross a lift, we said our goodbyes and I pedalled off up the hill. 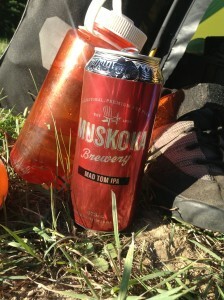 I cycled through Algonquin with my eyes peeled for signs of the King of the Forest. The scenery looked just right to have a moose in the foreground. All around was lush forest, broken up by granite rock and cuts in between the hills to reveal a lily-pad sprinkled lake or a swamp buzzing with flies. 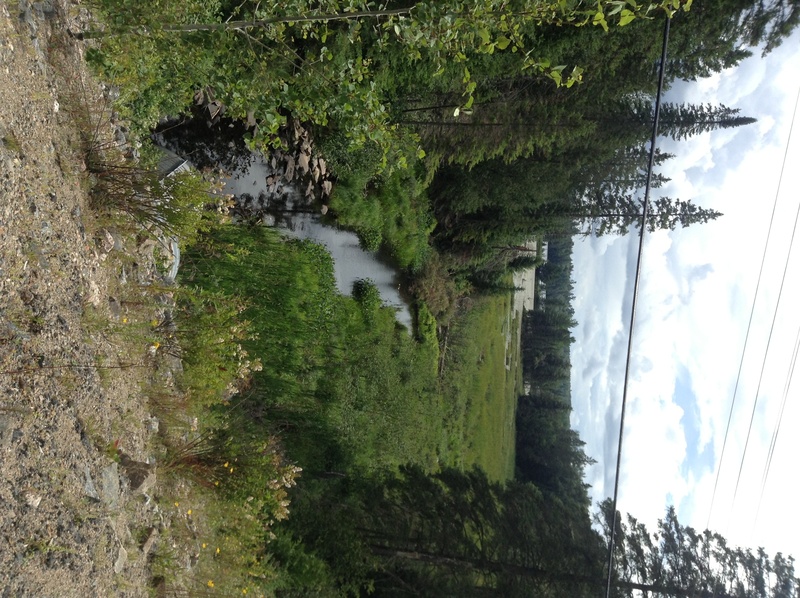 Algonquin park is like a big adventure playground. All morning I passed canoe outfitters and signs for snowmobiles, campsites and picnic spots. It was all very beautiful but it was sorely lacking one thing: a moose. After leaving Algonquin, gradually the scenery changed to become more agricultural and settled. Small roadside towns and cottages appeared. Fields of hay and golf courses replaced the forest and rock. The only thing that stayed the same all day was the hills. By 2pm I was cycling out of Barry’s Bay and racing towards the campsite. Lo and behold on the highway ahead of me I saw the familiar outline of a man with an Ortlieb pack and a Surly bike at his feet. “When’s your flight?” I asked Ross as I slowed down for the second time. It’s Tuesday today and I am planning to arrive in Ottawa by Thursday afternoon. I wondered if Ross would be better off cycling but he’d sold his bike trailer a couple of days ago. Cycling with his pack on his back was very uncomfortable. Ross was from BC and originally he’d wanted to cycle across Canada but couldn’t find anyone to go with. There have been a few people I’ve met who said the same thing. My usual reply is “Oh, I’ve met lots of people cycling. Just go for it!” I couldn’t find anyone to do it with me (and I did ask!) Yet thanks to the Wanderers, Kat, Bryan, Nicholas, Rob, Courtney and Danica, I’ve enjoyed some excellent company en route. Although today, other than 2 brief conversations with Ross, I have not spoken to anyone. But on balance, the solitude of the road is worth it for every pedal stroke that I get to see a bit more of Canada, for every kilometre that the sun shines on Monty’s spokes, and for every tree truck that I excitedly mistake for a moose. On balance, if something is worth doing then it is worth doing solo. *thats the fastest Monty has ever been cycled and the fastest I’ve been in Canada. The fastest I’ve ever been was 51.3mph (83kmph) on my mountain bike down a very, very steep hill in Oxfordshire. “Oh, it doesn’t have Tarmac again until you’re just outside Novar,” the man replied, one arm resting on the Algoma chair, the other hand cupped around a pleasant drink. Just outside Novar was, according to Google maps (which had helped me get into this pickle in the first place), about 13 kilometres away. That meant 13km of cycling on a sandy, bumped, pot holed dirt track. My heart sank. “Is there a beer store in Novar?” I asked, since the man seemed to be the sort of man who would know the answer to that. Indeed there was. Light at the end of the tunnel came in the form of beer at the end of the dirt track. I set off down the track and promptly skidded as the front wheel entered sand. The track pitched to a new vertical descent. Monty wobbled nervously. His brakes protested. 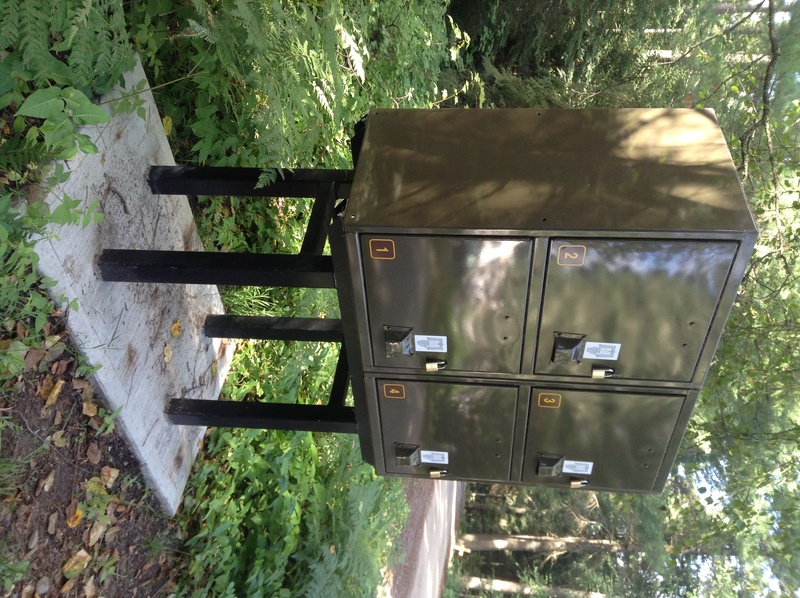 For the first time in Canada there was nothing to do but get off and walk. The day had started by saying goodbye to the Wanderers to the last and final time. 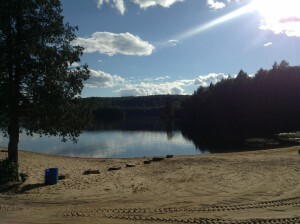 They were headed directly east towards their music festival in Montreal, whereas i was going north to join a 3 day canoe trip in Algonquin park. It has been fun cycling with them. I have realised while cycling by myself how much having someone else there can distract you from the pain and lighten the burden of worry when things go wrong. In fact, what is miserable alone is bearable with two. And highly comedic with three. 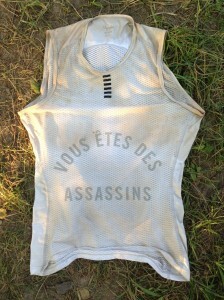 With the Wanderers cycling was often very funny – both intentionally and unintentionally (see somersaults and poison oak for more details). I shall miss them. Monty’s brakes weren’t feeling great so I set off to Bracebridge to get Monty some TLC. Ecclestone cycles proved to be a very friendly bike shop; the guys in there adjusted Monty’s brakes, pumped up the tyres and cleaned the chain for free. The owner also gave me some advice the route ahead. This is going to be a good day, I thought. Taking backroads to avoid a highway inevitably means hills. In Ontario, where even the main highway can’t avoid the bumps, backroads duck, dive and tumble like a rollercoaster route. The landscape here is very chopped up. It made me think “this is gonna be a tough day” so I stuck some music in to distract myself. Yet after a few climbs I realised that although the climbs were hard work I felt good: yesterday’s rest day and the last 4000+ kilometres of training had paid off. I passed through cottage country. The road winding through the forest was dotted with wooden holiday cottages. 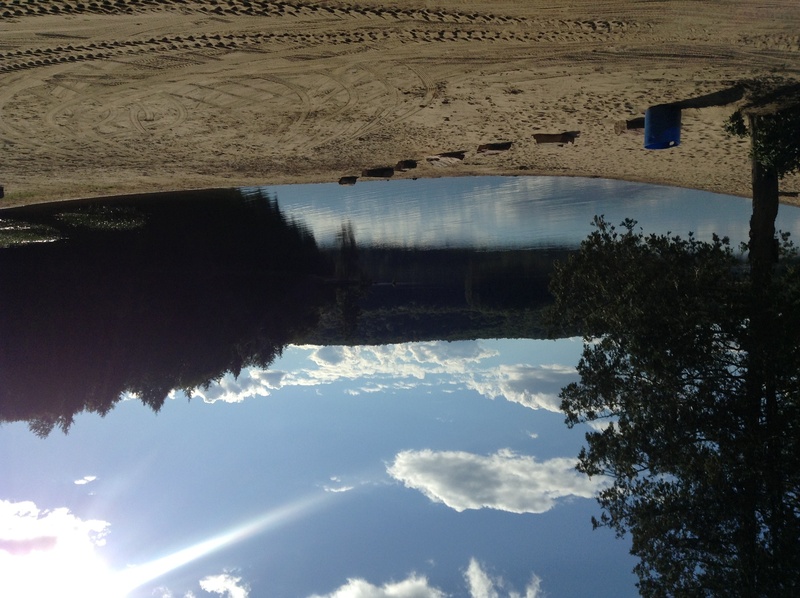 Muskoka, the area I’m in, is a popular spot with city folks from Toronto who buy cottages here in order to enjoy hot summers fishing, canoeing and lazing in the sunshine. 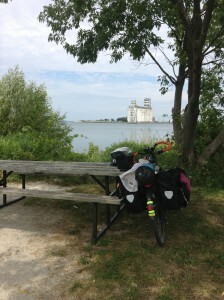 A few kilometres past Huntsville, I stopped for lunch at a quiet spot by lake. All was well. I felt happy and very on schedule. But then it seemed to get hillier. Memories of north Devon came back to me. 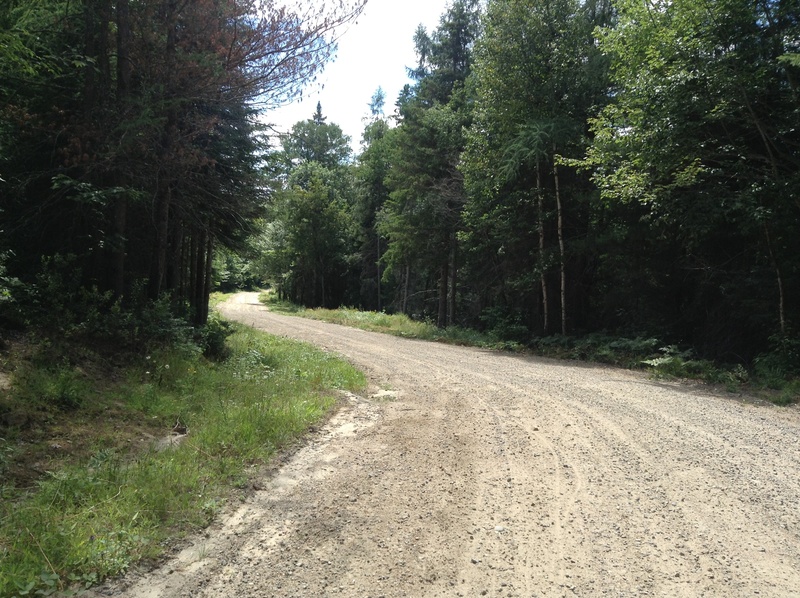 And then what I feared appeared before me: the road descended into gravel. And, worst yet, sand. Monty wobbled as his tyres sliced diagonally through the thick sand. At the side of the road was a house. It was a typical wooden cottage but it was so beautifully decorated with flowers, and ever window frame and corner was so neatly painted in bright colours that I could not help but stop. Sitting outside was a man, enjoying a beer on his garden chair. 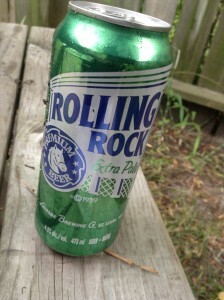 He warned me that the road wasnt going to get better, but also informed me there was beer at the other end of the road. There were no other options but to push on. I pushed Monty up the next sandy bank. How long was this going to take? What about Monday? I was headed to the small town of Kearney for my canoe trip but on Monday I would have to return south again before I began heading east to Ottawa. Do I have to walk this again? Should I risk the highway? My sandy detour was not only much tougher terrain but also 20km longer than the highway. Eventually the sand gave way to rough concrete road and then Tarmac. I could have kissed the ground! Poor Monty had had a rough ride. Thankfully the very small town of Novar had a pay phone so I was able to call my mum to wish her a happy 60th birthday. She had celebrated her birthday by going to the watch the Tour de France arrive in Paris and I was keen to hear about the trip and wish her a happy 60th before I headed into the wilds. Unfortunately I spent a good chunk of our conversation fretting about the road and how I would return south to Huntsville! What on earth makes that ordeal worthwhile? I arrived at the campsite having done 106km on what was supposed to be an easy day. 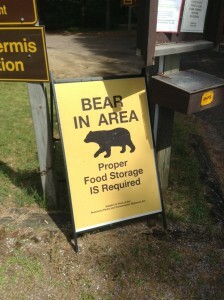 But upon arrival, I was charged $10 less the listed price and told I could camp anywhere. Indeed, the kind lady recommended I camp by the lake. What makes 106km of tough, hill climbing and a detour via sand dunes and gravel track worth while? I could think of only 2 things – but I had them both. 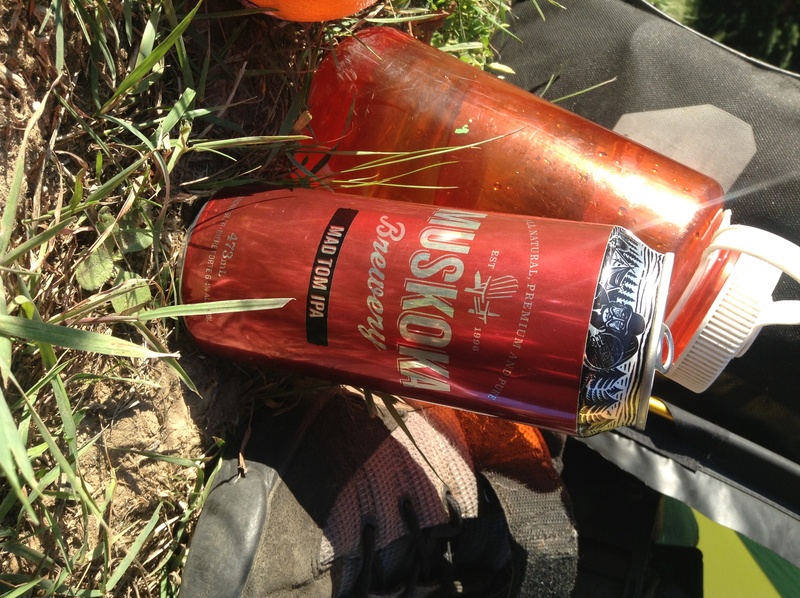 Worthwhile reason #2: local Muskoka beer. 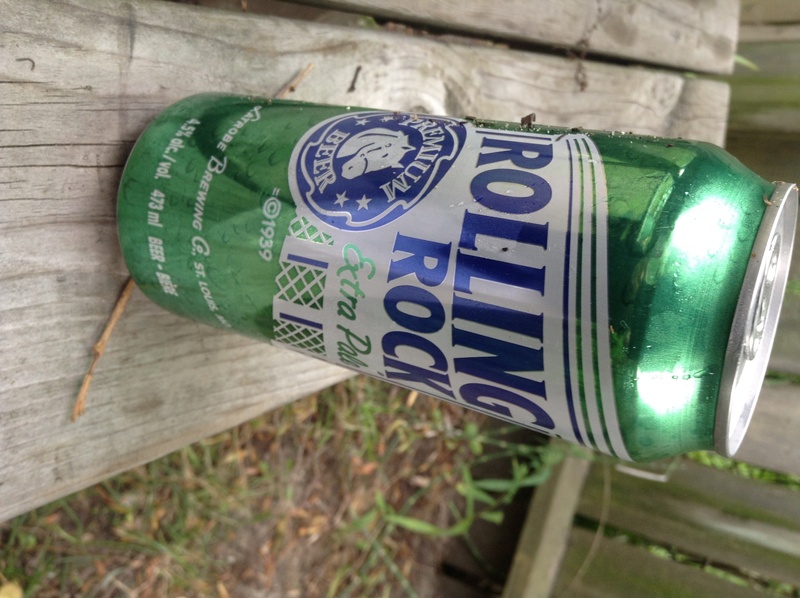 I had this can entirely to myself. You know you’re having a tough day when the generosity of someone giving you a square of tin foil nearly brings you to tears. At this point it was about 3pm and I was in a grocery store stocking up on the necessary ingredients for a delicious and cheering campfire meal. I needed a cheering campfire after today’s awful, awful, AWFUL ride along Highway 11. This wasn’t the Road to Hell so much as Hell Itself in highway form. The four-lane highway was very, very busy with cars and RVs headed north from Toronto. The cars zoomed past at terrifying speed. In fact, forget my description – just imagine the M1 on the Friday afternoon before a bank holiday. To make matters worse, the paved shoulder I had to ride on was about 6 inches wide. 6 inches. I was cycling along at some ridiculously fast pace – fear clearly strengthens one’s leg muscles. 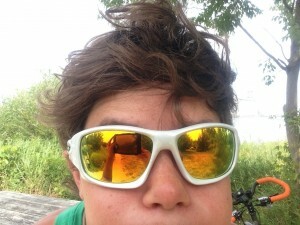 I pedalled in a state somewhere between abject fear and gritty, determined focus. I was hungry. I had already done 60km and eaten little more than a protein bar all morning. I had been on the Highway of Hell for over 10km. Every second was terrifying. Cars honked at me. (Yes, because adding to my state of witless terror by startling me with a blasting horn is going to help!) Trucks screamed past. I scanned the roadside looking for somewhere to eat lunch. I spotted a gas station ahead. there was a patch of grass and a tree under which I could shelter. I peeled off the highway, hungry and shaken. I sat curled in a ball, eating my avocado and crackers off my knees, and worried about what to do next. The clouds threatened rain. Google maps showed a possible detour which took an extra 20km. But were those side roads really roads or just bumps of exhausting gravel? I was scared of the solitude of empty, forest roads. But even more daunting was the prospect of cycling alone along the M1. Either way, I needed to push on up the highway for another 6km before I could pull off. At the turn off I pulled up at a small grocery store. Inside the store I collected food for my campfire. 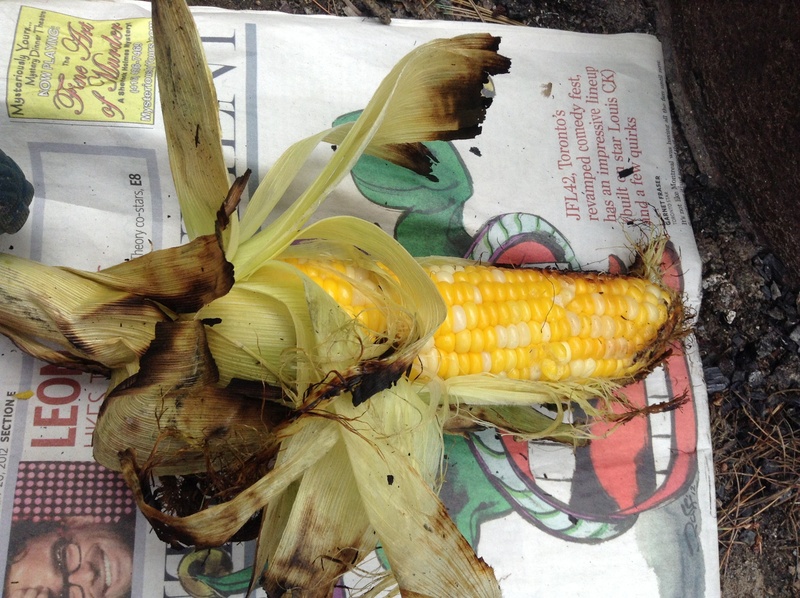 “Excuse me, do you have a piece of tin foil i could have for cooking this in a campfire?” i asked the woman at the store, pointing at my corn. When the woman returned with a square of foil I nearly cried in gratitude. The kindness felt like a cloth had been lifted from my body, unveiling my vulnerability. With 40km to go I entered the back roads of the forest. The scenery had changed again. 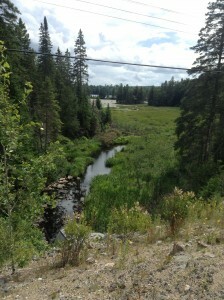 The thickening forest, wet grasses, rocks and sudden, sharp inclines told me I was back into northern Ontario. The dense forest was pierced by the grey road as it twisted and turned through the wilderness. Although relieved to be away from the highway, the solitude of the wilderness and the looming grey clouds cast a darkness over my mood. Was that the sound of an aeroplane? Or the long, distance rumble of thunder? Here the wild things live. This is sort of place where the only soul you are likely to meet is a lone man with a gun. Or a bear (if bears have souls. A topic for another discussion perhaps). I sang to myself for comfort and cheer. And dipped into my pannier for a handful of my emergency Jelly Belly beans. 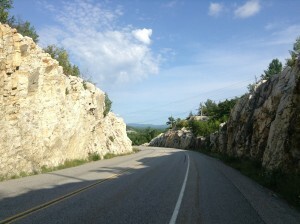 For 40km I pondered the wild idiocy of my decision to cycle across Canada. I still have to get to Kearney by Friday morning and that means either going back on highway 11 or another lengthy detour. Finally I arrived at the campground. It is expensive. I even upgraded to a site with electric. But I don’t care. This wasn’t supposed to be terrifyingly hideous. It was supposed to be “fun.” Yes, it was going to be a challenge but I had encounter enough challenge today. I have my own water tap, my own electric plug, a campfire, lots of firewood and a nice, dry tent. This, I consider, is the height of luxury. 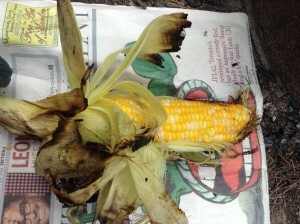 I cooked maple syrup flavoured baked beans (nice, but oddly sweet), spider dogs and roasted foil-and-husk-wrapped corn on the fire. The sunset. The clouds parted to reveal a scattering of stars. I sat cross legged watching the embers of my fire glow. The worries of the day melted like the marshmallow turning to goo in my hot chocolate. Thankfully the Road of Hell led to something rather heavenly. 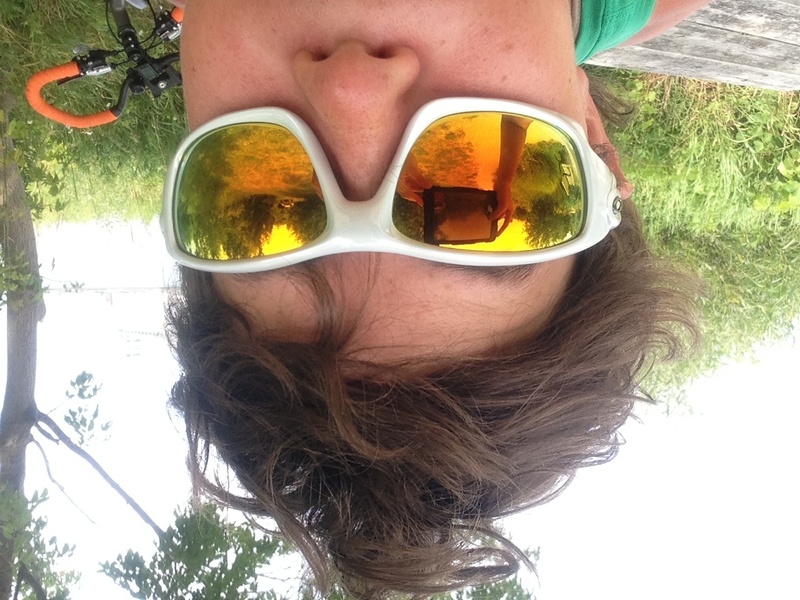 Campfire, Cycling across Canada, Ontario, why am I doing this? Today’s cycling has been some of the best yet. Not least because rather than slogging away for 6 hours+ on my bike, I have ridden only 85km. 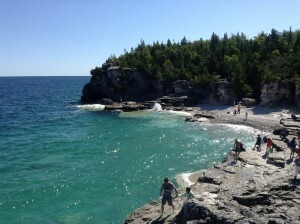 Today i followed the coast of Georgian Bay, passing through small, hipster-looking towns and meandering along a bike trial in the sunshine nodding at fellow cyclists. Today I passed through the so-called Blue Mountains. Although I could see a few ski runs, the mountains didn’t seem to be very mountainous. Nonetheless I enjoyed the views of the blue water of Georgian Bay that I glimpsed through the apple orchards and was intrigued by signs for various wineries. After 60km I stopped in Collingwood to go on a small spending spree. Having lost my sunglasses a few days ago and with lots of sunny days ahead (including my 3 day canoe trip this weekend) I needed some new ones. Given there’s no one here to talk sense to me I decided to splash out. And given that there’s no one here to tell me how silly I look I decided to get some silly ones. Silly face to match silly glasses. Yeah! More sensibly I also purchased a new vest top. I have realised that my once apple green icebreaker top is turning the colour of stagnant pond water (and probably isn’t far off smell-wise either). And the white Rapha top which was brand new before I left looks like it has been swimming in coffee. I should point out I do launder my clothes at every opportunity (about once a week) but there is no hope for clothes that have endured over 4,500 kilometres of sweat, suncream and thunderstorms. All in all I spent a ridiculous amount of dosh today. I was very tempted to buy a Go Pro but realise I should have asked brother Dan (who is expert in such things) for advice and a demo before I left for Canada. I could imagine buying one only to return to England with a month’s worth of footage of the lens cap (or equivalent stupidity). Yet I am sorely tempted as the Go Pro could gather wonderful footage of Me Cycling On Monty and who wouldn’t want to watch that for 100 hours unedited? Despite a few patches of busy road traffic the cycling was glorious due to the relative cool weather, flattish terrain and views of Georgian Bay. After a mere 80km I stopped at a Tim Hortons to Skype with Ruth (who embarks on her next leg of Land’s End to John O’ Groats, ie top to toe of UK, tomorrow). After yesterday’s disappointment I decided to get a beer to finish the day. At the check out I was asked for ID. When I presented the man with my UK driver’s license he proceeded to get out a tome detailing all the IDs of the world (such a thing exists?!) He is not the first person to be wholly confused by a UK license that says “CANADA” on it (ie place of birth). A quick Google search narrowly saved me from staying at the self-proclaimed “party campsite” of Wasaga. 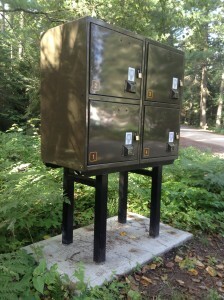 A campground that boasts you will “make friends” while partying to its own live DJs etc. Wasaga, I should point out, appears to be the Canadian equivalent of Newquay: the place where young folks come to comatose themselves with cheap alcohol, acquire tattoos and/or piercings their parents will despise, and lose their virginity on the sandy beach. Hmm. I cycled along the beach front road and recalled when I was last here. When I was 18 years old I came to Wasaga beach with two girls from Toronto. Then I thought myself the epitome of cool as I watched the sunset while floating on the lake atop my newly purchased pink inflatable sofa. (That was my one and only outing with said pink sofa which I shortly after gave to a student in Toronto). Today I passed the ice cream parlours, body piercing stores, bars and pink inflatable stores without wishing to go inside. Despite my Google searching, the “family campground” I am staying at bears a close resemblance to a music festival: tents pitched haphazardly on a misshapen patch of grass, portaloo in the corner, shower cubicle festooned with clusters of someone else’s hair, miscellaneous dance music crackling from poor quality speakers, man over there naked bar for magenta shorts etc. I was even given a purple wrist band when I arrived. I was thinking about taking a rest day here but Wasaga makes me feel old. I do not care for the live DJs, foam parties, or recreational drugs on offer. Give me the quiet lakeside spot where the loudest noise is the call of a loon, and the night air is filled only with the smoke of my smouldering campfire. The best thing about cycle touring is that I can leave tomorrow. In search of my loon and campfire. I woke up to the sound of rain pattering on my tent. Oh well, I thought, turning over to catch another half an hour’s sleep. Oh eek, I thought, a second later jumping out the tent in just my underwear to rescue my bike shorts that had been left outside overnight to “dry” on Monty. I found the Wanderers curled up in the washroom eating breakfast. This has become something of a feature of the trip: rainy mornings hiding in washrooms. The only plus side of the rain was that it wasn’t so hot. We’ve had a couple of really, really hot (over 30 degree ) days. It’s been tough to cycle in. The recent heat has also caused heat rash on my bottom. Specially, on the spots where bum meets leg meets saddle. Signs of it first emerged a couple of days ago. First I was a bit perplexed because it doesn’t look or feel like normal cyclist’s chafe. But it hurts. It feels like I am sitting on a stone. I climb out the saddle and sit down again, trying to find a more comfortable spot but it soon gets sore again. It made for an uncomfortable day’s riding all day. After a very large coffee in Tim Hortons with Kat we set off cycling along muggy, drizzly highway. There isn’t much to say about the scenery today. Mostly just undulating hills, lots more traffic, a thin shoulder, some trees, some signposts, an overcast sky etc. 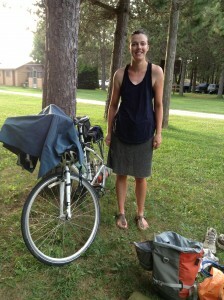 Reason #1: Kat met a man cycling across Canada west who decided to wild camp. He had left an apple in his tent. In the middle of the night a bear sniffed him out, swiped his claw through the canvas, grabbed the apple, starred the man down and slumped off into the forest. Eek. 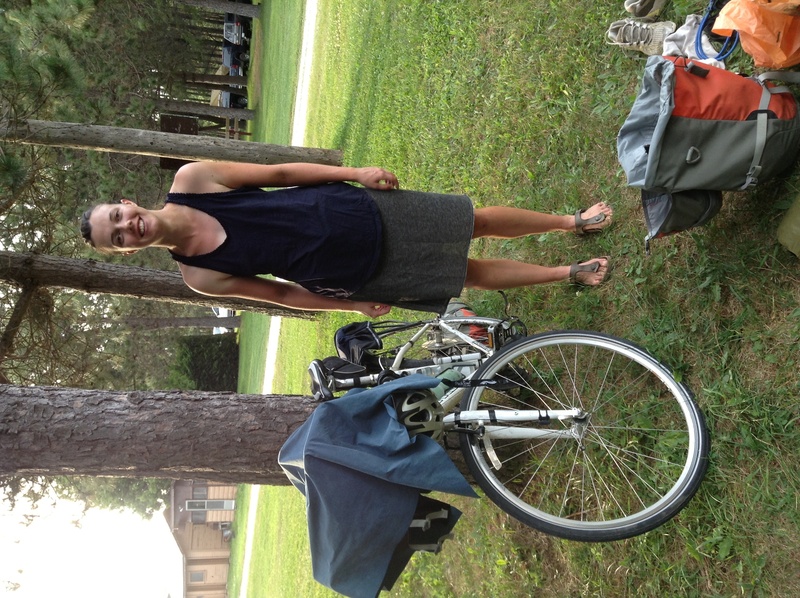 Reason #2: Kat met another man cycling across Canada who decided to wild camp in the Middle of Nowhere. He was located miles from anywhere, hidden away in the forest, invisible from the road. In the middle of the night he was woken up by the violent shaking of his tent. He unzipped his tent to find a homeless man. “What are you doing?” The camper exclaimed. “I couldn’t open the zip,” the homeless man replied. Without further explanation he wandered off into the forest. Oh. So maybe I won’t wild camp. 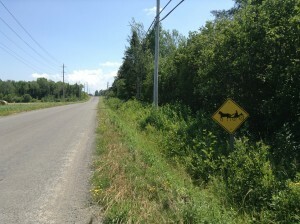 After 100km of riding I turned right off the highway towards Manitoulin island. I arrived in the town of Espanola and headed to one of the town’s 3 grocery stores to pick up supplies. Somewhere between the chicken and the fruit I bumped into the Wanderers. Then near the potatoes I saw Kat again. Outside, packing up Monty, I spotted another two cyclists who came over to chat. They are a slightly eccentric American duo cycling from Seattle to Boston. And then, just as I was packed, a small family cycling across Canada from Vancouver with their 10 year old son rolled in. That’s right: 5pm on a Thursday outside a grocery store in a small town in northern Ontario gathered a total of 9 trans continental cyclists. It’s a small world. Out of Espanola the landscape quickly changed again. It was hot, very hot. and the air smelt of wet grassland and salt. Suddenly it was very hilly. I rued the large amount of groceries I’d purchased as I pushed down into my lowest gears. After a long day on the road the Wanderers and I swung into the campground. It was an odd sort of place. “Is there a shower?” I asked. I didn’t make use of the inflatable dinosaur, but I did go for a swim in the river. Some Canada geese were floating downstream, the light was lower in the sky, a number of coloured boats were lined up on the grassy banks on either side. It reminded me for a minute of swimming in the Thames. I haven’t eaten enough pancakes or maple syrup on this trip. In fact, before today I don’t think I’ve eaten any pancakes and only a small amount of maple syrup has entered my mouth, mounted on some other variety of wheat-based foodstuff. This morning at the campground I met a nice man wearing a triathlon tshirt who, it turns out, has done no fewer than 3 ironman triathlons. And he is training for his 4th. I have by this point decided that doing an ironman shall be my next challenge. So it was good to chat to him and hear his tips. Heading out of the Soo, I’d been advised by the folks at the bike store to take the scenic route off the main highway. I’d also heard that it was going to be “flat”. It was not flat. Okay, there were patches of flat but the gravel road I was on managed to seek out every bump and hill and traverse them at the worst possible angle. For the first time since Vancouver I also had to – shock, horror – navigate. Usually I am on the same road for the entire day. Or entire week. The twists and turns (okay there were only about 6) had me reaching for the GPS which slowed me down. Nonetheless it was the scenic route and in hindsight I’m glad I took it. I could enjoy the pastoral scenes as I passed through Mennonite country. The landscape had changed significantly since yesterday. Gone are the rocks and forests. The scene today was agricultural with views of wooden, red-painted barns surrounded by fields of fresh hay bales. Swallows dipped and dived over the crops while a flock of sparrows flew from the water tower. 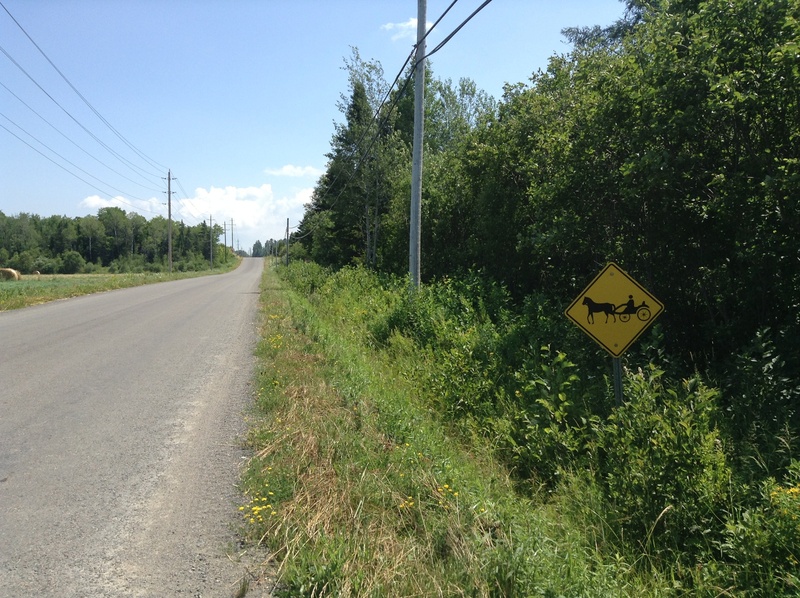 All day I saw road signs warning drivers of horses and carts (which also served to warn me and Monty of the house droppings on the road…) And here and there along the roadside were small stalls selling fresh eggs and maple syrup. Maple syrup! How have I been in Canada for so long and not eaten more maple syrup? Thinking back I can only recall eating maple syrup on French toast back in Hope. That was over a month ago. Outraged by my lack of the sweet stuff when I rolled into town and saw Kat in a restaurant I decided to rectify the situation. And the maple pancakes tasted so good. Nom nom nom. 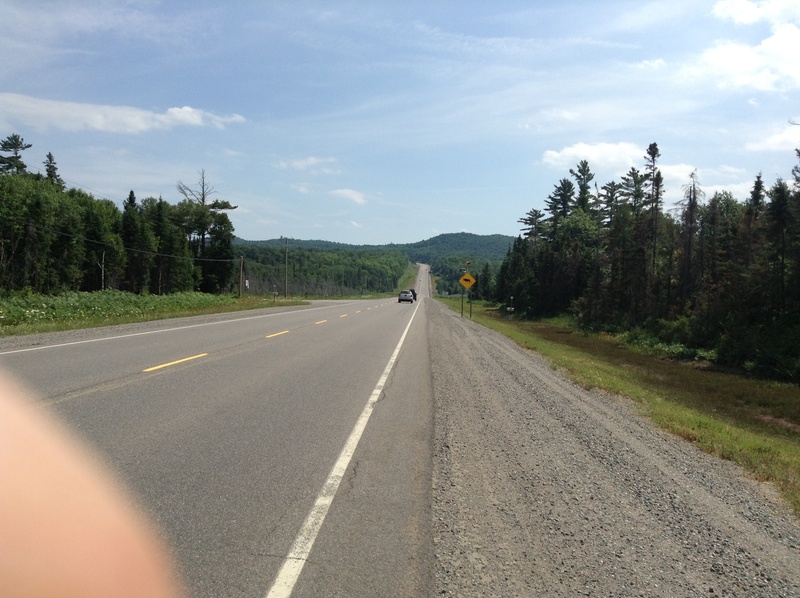 I arrived at the campsite just outside of Blind River having cycled 67km without a break. Which I guess is about 3 hours of continuous exercise and thus some sort of personal record. Kat and the Wanderers pulled into the campsite a little later. We hung around, eating dinner together. It was a nice end to very good day on the road. That’s what the Tour de France riders cried when the route organisers first plotted the tour’s route through the Pyrenees. 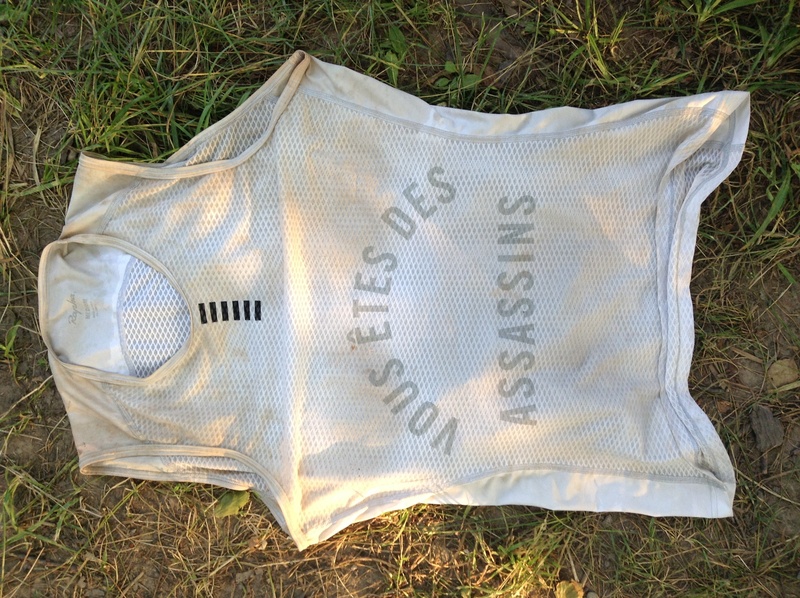 The words are emblazoned on the front of the Rapha top that I have been wearing on most of the trip. And which I was wearing, quite fittingly, today as I climbed the steepest, most evil, hernia-inducing ascent so far. I knew it was going to be a long day as my short(ish) day yesterday meant I had 140km to the Soo (aka Sault Ste Marie). The forecasted weather was hot with highs of 31 degrees. The predicted terrain was hilly with highs of… High. So I set off at 8am from the campsite, enjoying the low glowing sun as it cast the westerly shadow of Monty and I pedalling. The wind was already beginning to pick up. A headwind, of course. As my average speed dropped lower and lower with each climb (down to 15km per hour at one point) I started getting concerned that I would not make it to the Soo before night fall. Something needed to be done. I reached into my pouch and pulled out my “double latte” energy gel. Now normally I would not promote any specific item in my blog yet this Clif energy gel transformed me into a pro rider, like Popeye eating spinach. Within seconds my legs were pumping at twice the speed. I pedalled faster and faster. The hills slowly flattened out. Up ahead I saw the Wanderers (they had stayed at a different campsite 20km further ahead than me). I was gaining on them every second. The scenery today was absolutely stunning. The road followed the shoreline of Superior. This is a place for adventure. Cars drive past carrying canoes and sea kayaks, hunting for adventure, chased by laden motorbike tourers. In the bay the black outline of a group of swimmers splashed around. The water is so clear that I could see the pebbles at the bottom of the lake from the roadside. I have seen skateboard ramps that are more gently sloped. I have heard of ski jumps which are not as steep. Indeed, I have known chunky blocks of cheese that have a lesser gradient. Canadian road builders: vous etes des assassins. By the time I met the Cheese Wedge of Doom I had already cycled a cheerful 116km. I slipped into my lowest gear (which is actually very very low since Monty has mountain bike gears). I had to keep pedalling to save falling off, rolling backwards and to stop Monty’s front wheel peeling off the near vertical ascent. Yet each pedal stroke felt like I was sitting on one of those leg press machines at the gym – doing the maximum weight possible. My heart was pounding. I was sweating so much that salt was visibly clinging to my skin. My head was sweating so much underneath my helmet that it felt like my head was crawling with lice. Yikes. I am actually going to collapse. Just before I was about to pass out I pulled over into some shade and poured a bottle of water over my head (thankfully remembering to first take my iPod off). But my water bottles were now all tepid. The ascent continued for another 2 kilometres. Vous. Etes. Des. Assissins. I huffed, and I puffed and, finally, I conquered the hill. 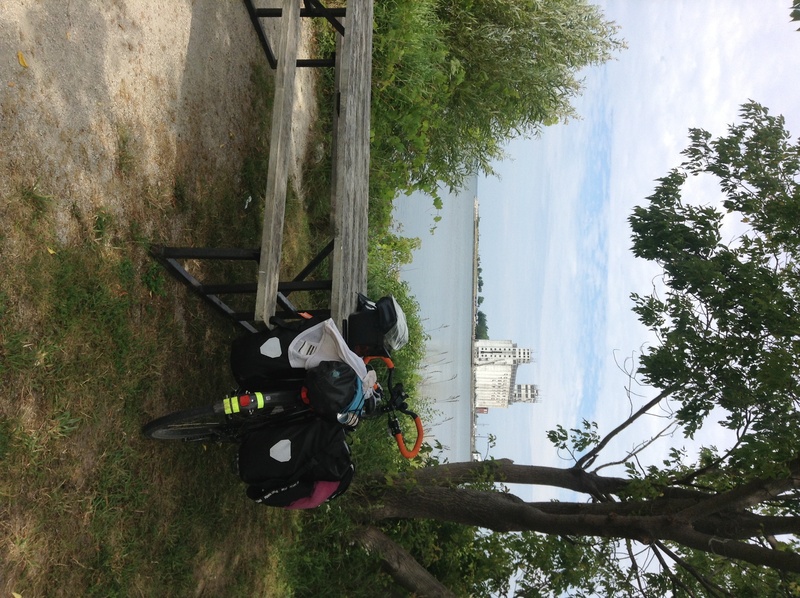 There were still another 18km or so to the Soo. Just as well as I couldn’t have managed much more. I arrived at the Velorution bike shop, an awesome place that offers free camping for cyclists. Here I met Bryan (who I cycled with back in the Rockies) and Kat (whose blog I have been reading for weeks). Kat already had some beer chilling under a bag of ice. Just what I needed. If I don’t have to do another hill like that again in Canada it will be too soon.